Congratulations Dr. Jean-Jacques Chaubard’s Team Vision Future – TP 52! Reichel/Pugh Design No. 197 has won the 2017 IRC European Championship – Class 0 in Marseille. Click to read the “Smallest winner crowned IRC European Champion” article by the Royal Ocean Racing Club. Many of the R/P team members are involved in their respective areas of expertise through local engineering communities and professional societies. Recently, R/P composite structures engineer Adrian Sawyer, SAMPE member since 2012, shared some of our work with his colleagues in the Southern California composites industry. An incredible testament to the strengths of modern composite materials, the recently-launched Baltic 130 Custom is made up of over 4 football fields worth of carbon fiber, but its structural weight is still less than 20% of the yacht’s full displacement. Saint Barthélemy (April 10-15, 2017) – This past weekend the eighth edition of the annual Les Voiles de Saint-Barth concluded with three victorious Reichel/Pugh designs. Maltese Southern Wind 94 Windfall, Reichel/Pugh Design No. 205 and the second launched SW94, was the Maxi 2 Class Winner under tactician Ian Walker and helm Nelson Moore. The Dutch Marten 72 Aragon, R/P Design No. 158, was second in the Maxi 2 Class under skipper Nico LeCarpentier. Also on the water were four Reichel/Pugh-designed Melges 24s with a class win by local Team Island Water World. The Reichel/Pugh team wishes warm congratulations to all competitors. The next edition is slated for April 9-14, 2018. The R/P team has been commissioned to update the new 100’ Black Jack and is currently conducting a comprehensive CFD study to develop new foils for the 2003 design. Modifications will be completed by McConaghy Boats, Sydney and the boat will compete in Cruising Yacht Club of Australia’s July, 384nm Sydney-Southport race in full Black Jack livery as a tune for the December’s showdown to Hobart against Wild Oats X1 and other contesting Maxis’. Originally commissioned by Neville Crichton, Reichel/Pugh’s first 100’, the canting ballast Alfa Romeo was designed in 2003 and launched for the 2005 Rolex Sydney-Hobart Race. Alfa Romeo 100 took 2nd place in that Hobart to Bob Oatley’s R/P-designed line honors winner Wild Oats X1. Alfa Romeo then headed to Europe to relentlessly set records before heading back to Australia in 2009, but not before setting a new Transpac Race record along the way. Once back in Australia, Crichton’s impeccably prepared Alfa Romeo again faced a rematch with her near sister-ship Wild Oats X1—this time soundly trouncing the Wild Oats for Hobart line honors in 2009. These two Reichel/Pugh 100-footers dominated the Maxi scene for over a decade with Wild Oats taking line honors in the Sydney Hobart race a record 8 times, winning twice overall on corrected time and beating the course record twice. After the 2009 Hobart race Alfa was sold to a European owner, renamed Esimit Europa and continued to dominated big boat racing in Europe for five years. Australian, Peter Harburg has purchased the Esimit Europa to bring her home as his new Black Jack. Reichel/Pugh welcomes Peter back into the family, having owned the 66’ canting ballast pocket maxi Black Jack who took 3rd overall in the 2012 Sydney Hobart race and 1st overall ORCi. The R/P design team is honored to be updating their design, which has dominated for so long. These designs are further proof of the innovation and longevity that comes with the R/P brand. Reichel/Pugh caught up with Olympian Dave Hughes to discuss sailing the Melges 24 which was designed by Reichel/Pugh in 1992 and remains one of the premier sportboat classes. Dave was tactician on the newly crowned 2016 Melges 24 World Champion team of Embarr. SARASOTA, Fla. (March 19, 2017) – Congratulations to Matthew Woodworth, the winner of the Melges 14 Midwinter Championship. Charlie Buckingham placed second overall and Mitchell Rogers took third. In the first sanctioned regatta for the Melges 14s, Woodworth held a commanding lead throughout and took home the very first Melges 14 Champion title. 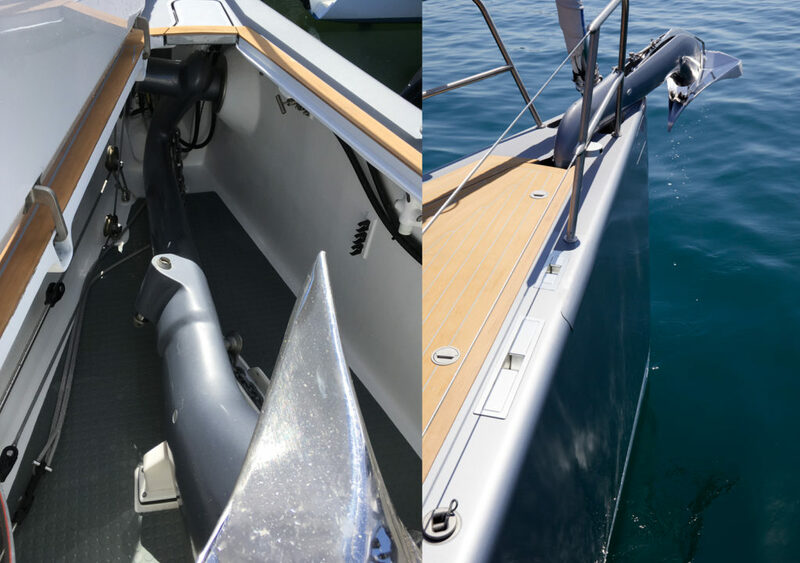 Here’s another great example of Reichel/Pugh’s highly-refined engineering and optimization: the FEA-optimized carbon fiber anchor arm on the custom RP90 built by Southern Wind. Antigua Yacht Club (February 19, 2017) – Persistence paid for Antiguan Bernie Evan Wong as his Reichel/Pugh X-Treme 37 Taz won IRC Class 1 in the 9th edition of the Royal Ocean Racing Club Caribbean 600. Reichel/Pugh Yacht Design wishes a warm congratulations to Team TAZ – Carbon Beast as well as to all of the 2017 competitors. 18 winners of the ShowBoats Design Awards 2017 have been announced and Reichel/Pugh’s 130′ My Song has been crowned The Most Innovative Sailing Yacht of 2017. Reichel/Pugh wishes all those who submitted and the winners a warm congratulations. The latest collaboration between G-Force Yachts and Reichel/Pugh Yacht Design is the fast and fun X-Treme 32 – A high performance design for inshore and offshore racing.